There is no better place in the country to enjoy a baseball game than Boston. There are plenty of sports bars, but if watching the baseball game is what is important to you, grab a draught at one of these pubs. Baseball is tops on their agenda. Included on this list is America's First Sports Bar, two different year's winners of the #1 Sports Bar in America by Sports Illustrated, the #2 Baseball Bar in America by ESPN, and a handful of others you won't want to miss. 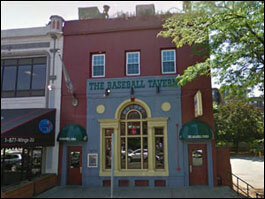 The Baseball Tavern is located just a short fly ball from fenway Park. Their three spacious floors offer year round enjoyment. Their Roof Top Deck, overlooking Fenway Park, is one of the most popular fun spots Boston has to offer, from the first pitch on Opening Day until the final out is recorded in the Fall Classic. Whether it's before, during, or after a Red Sox game, or just anytime you're looking for some fun, stop at The Baseball Tavern for a good time. 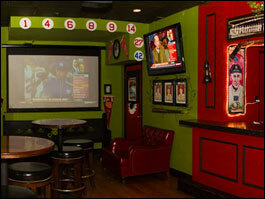 All floors of the Baseball Tavern provide plenty of Big-Screen, High Definition TV's for a good view of the game. In addition to watching your favorite Professional and College sports, you can enjoy their great sound system, play a game on one of our many pool tables or video games, or take a chance at winning the Lottery. Of course, you can always just sit back and enjoy a great crowd of people and some great food. Boston is a city of history. 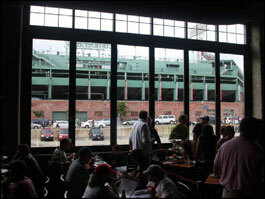 It is fitting that the hallowed grounds of Fenway Park have been a mecca for baseball history for nearly a century. As the oldest current baseball stadium in the country, Fenway has a different feel than any of its newer billion dollar counterparts. You cannot escape the history that has transformed itself into legend. Lying beneath the bleachers in center field, a few feet from Ted Williams Red Seat is a unique bar where the patrons are treated to not only great food and drink, but an unprecedented baseball experience. 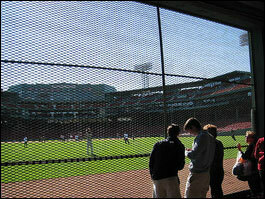 With a window that looks directly through centerfield and into the park, it is the only view of its kind. 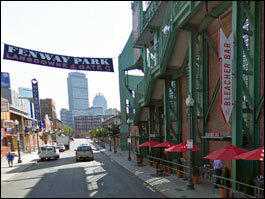 The Bleacher Bar is a place where you can not only relax and an enjoy and extraordinary bar experience, but a place where you can feel the very history that is Fenway Park. 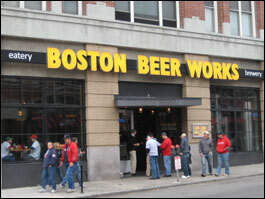 With its perfectly positioned location across the street from Fenway Park, Boston Beer Works can be overrun with baseball fans between April and September. But it’s worth popping in there at any time of year, if only for the beer, made on the premises, such as the crisp Fenway Pale Ale and the hearty Boston Red. There’s also a menu of above-par burgers and other munchables. 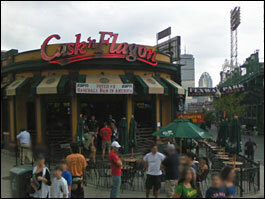 The Cask 'n Flagon was voted the #2 Baseball Bar in America by ESPN. Here in town, many have said that the Cask 'n Flagon is as synonymous to Fenway Park as the infamous Green Monster and the Citgo sign. After thirty-five years, the Cass 'n Flagon still holds the heart of Boston. 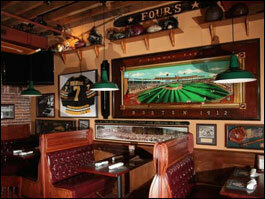 Its walls are filled with black and white photographs of old time baseball greats. Through the memories, in these photographs, history comes alive. 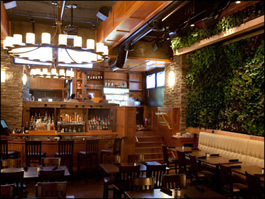 With its nostalgic atmosphere, outstanding staff and its commitment to the best customer service possible, the entire team at the Cask 'n Flagon is determined to provide you with a great experience no matter what your occasion may be. 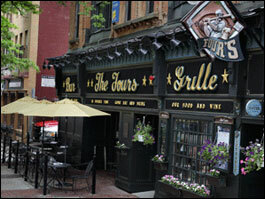 Voted the #1 Sports Bar in America by Sports Illustrated, The Fours Restaurant and Sports Bar has been a Boston Tradition since 1976. 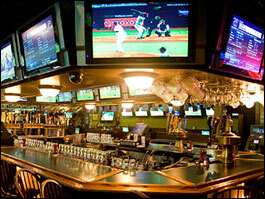 They have MLB, NBA, NFL, NHL and NCAA sports packages and 42 TVs to catch all of the action. 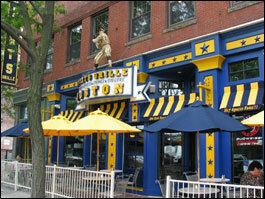 And they have most extensive collection of sports memorabilia in the greater Boston area. Start your trip to The Four's with a crock of homemade clam chowder, a New England favorite, or try their award winning buffalo wings. A specialty of the house is their hand cut steak tips charbroiled to order. They also feature fresh salmon, swordfish, broiled Boston scrod and baked stuffed shrimp. Their Hall-Of-Fame sandwiches are piled high. Game On! is America's #1 Sports Bar and an entertainment destination, combining the best of sports viewing and casual American dining. Game On! opened it’s doors in 2005 with the sole mission of being the answer to every sports fans dreams. They have the best viewing, sound, food, service and atmosphere to provide a fan experience that is close to indescribable. 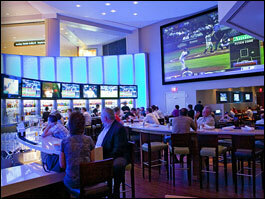 With over 90 high definition televisions, a state of the art sound system and cutting edge technology, Game On! 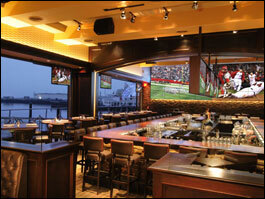 is America’s premier sports viewing venue. With their chef driven menu featuring New England classics paired with American comfort food and the best sports fare you've ever tasted, they will become one of your favorite dining destinations everyday not just on game day. 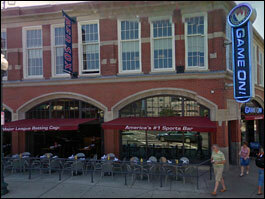 Located in historic Fenway Park they have managed to combine all of the historic elements that make Boston what it is. 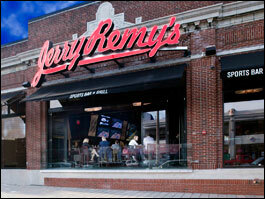 At Jerry Remy's Sports Bar & Grill at Fenway, there is never an away game. The president of Red Sox Nation is in the former home of the WBCN studios. They serve Comfort Food made fresh daily, with items suitable for all diets. Signature items are the House Smoked BBQ Ribs, and the Remy Burger served on Fried Dough. Their Audio/Visual game experience is unrivaled, as they have two huge 132" by 72" 1080p projection TV"s above their 34 seat bar. Jerry Remy's Sports Bar & Grill at Boston Seaport is a one of a kind sports bar experience that begins with New England's largest monster 32 foot HD videowall that will give you a better view than if you were actually at the game. 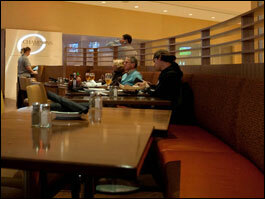 They also have 46 Large HD Plasma screens to guarantee there isn't a bad seat in the house. 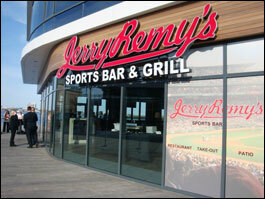 Jerry Remy's Sports Bar & Grill at Seaport is also on the water with a spectacular view of historic Boston Harbor. Whether you are planning your next after work party, hoping to run into Jerry Remy, in search of the perfect late night hot spot or looking for the best location to watch a game, come in for an experience where you can't go wrong. 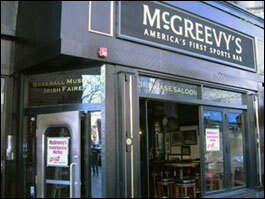 McGreevy's 3rd Base Saloon is a traditional Irish Pub dedicated to Boston sports, Boston history and great music. 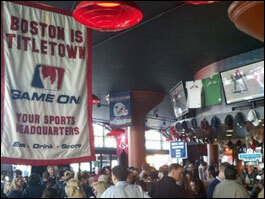 They're known as America's First Sports Bar, winner of Boston's best sport bar many times over, home of the Dropkick Murphys, the birth of Red Sox Nation and the best bar in Boston to kick back and enjoy a pint. Join them for a night of fun, sports viewing, drinks, food and friends. Thanks to an affordable, easy-to-navigate menu and 140 TVs, the Sports Grille Boston makes an ideal watering hole and an especially appropriate pre- or post-game dining destination. Sports fans of all stripes cheer on their alma mater or their favorite teams on one of the restaurant's 15 satellite channels. 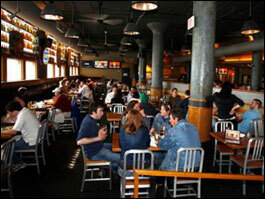 Friendly waitresses and bartenders are careful not to distract patrons from the big game. From pizzas to burgers to hot dogs, all the old favorites one finds at sporting events are here. Those without tickets to a Sox game need only grab a seat and munch on a pair of hulking chili-cheese dogs to replicate the experience. Juicy turkey tips and huge, freshly made salads cater to palates evolved beyond standard pub grub. If your team wins, indulge in one of the grill's all-American desserts (apple pie or chocolate cake). The Grille caters to families with a kids' menu, but parents should know that patrons can get rowdy during contentious games, namely Sox-Yankees match-ups. 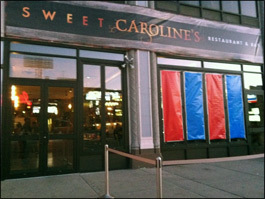 Sweet Caroline’s is so good, so good, so good. And right behind Fenway Park on Boylston. And with 11 flat-screens and three projector screens strewn about, there’s nary a bad viewing seat in the house for Pats, Cs and Bruins watching. 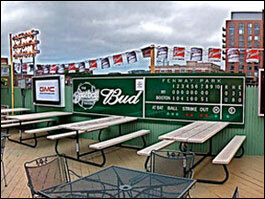 Unless, of course, you choose to hang out on the 30-seat outdoor patio opening in a couple weeks, which faces Fenway.